Unravel the mysteries of ancient Egypt on Cleopatra Slot! This popular classic slot machine is a 5 reel and 20 payline video slot. Created by the software virtuoso IGT, the reels boast eye-catching symbols. They can form amazing combinations for chances of winning big. Are you ready to discover more about this entertaining slot? Keep reading! 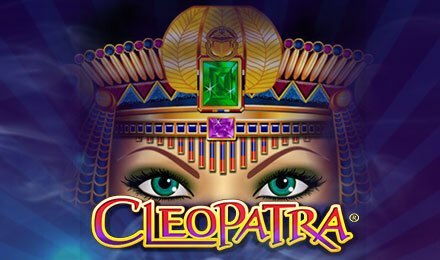 How to play Cleopatra slot machine? To start your adventure on this fun slot machine, there are a few things that you have to know. First, check out your betting options and adjust each one according to your likes. It does make a difference! Cleopatra slots UK is an easy and simple game that you can play on all your favourite devices. Geared up? As you spin the reels, you will find an array of symbols depicted in an Egyptian style. It includes the playing cards: A, K, Q, J, 10 and 9 royals. Plus, there's the scarab beetles, Eye of Horus, hieroglyphics, and lotus flowers. Bet Lines: On Cleopatra Slot, there are 20 Lines and you can choose between the following: 1, 5, 9, 15 and 20. The Line Bet includes the following: £0.01, £0.02, £0.03, £0.05, £0.10, £0.20, £0.30, £0.50, £1.00, £2.00, £3.00, £5.00, £10.00 and £20.00. Auto Spin Feature: The Auto Spin will play the game for a given number of spins at the current line bet. You can press on Auto Spin and pick the number of spins that you want to play at the current bet settings. Wild Symbol: On Cleopatra Slots game the wild symbol is Cleopatra. It can take the place of all the symbols with the exception of the Sphinx. If there are one or more wilds in a winning combination, your total payout will double. In the event you get 5 wild symbols across a win line, you will be awarded 500x your stake. Cleopatra Bonus Feature: This feature comes into play if you get 3, 4 or 5 Sphinx Scatter symbols anywhere on the reels of Cleopatra Slot. You will then be rewarded with 5, 20 or 100x your stake plus a total of 15 Free Spins. When this feature is activated you will benefit from a 3x Multiplier. However, this doesn’t work if you have 5 Cleopatra wilds on a win line. Get 4 scarab beetles and a wild combination to enjoy a doubled Cleopatra win and a 3x multiplier. This will award you with a 6x multiplier. Free Spins: If you get 3 or more Sphinx symbols on the reels of Cleopatra Slots, you will launch the Free Spins. The latter plays in groups of 15 Free Spins and you can revel in up to 180 Free Spins. They all come with either a 3x or 6x multiplier if it involves the Cleopatra wild. Looking for some Cleopatra slot sites? Irish Spins is your perfect destination! Get this adventure started on your mobile! You can prolong the fun anywhere and anytime for some top potential wins. A Welcome Bonus awaits you! There’s a stunning welcome bonus that awaits you on Irish Spins! Create an account and deposit to triple and double what you start with. On your first deposit, you will enjoy a 200% bonus up to £100 + 50 Free Spins on Starburst. On your second deposit, you can enjoy a 100% bonus up to £250 and finally on your third deposit, a 50% bonus is up for grabs.